There are also many “life or death” decisions on day cares and schools, breastfeeding, co-sleeping, discipline styles, natural foods and products. It’s often in January that we see women nearly burden themselves to get closer in achieving characteristics of Society’s Ideal Mother. My son at a chunky 4 months old. FAIL 1: I only made it six months of breastfeeding and pumping. 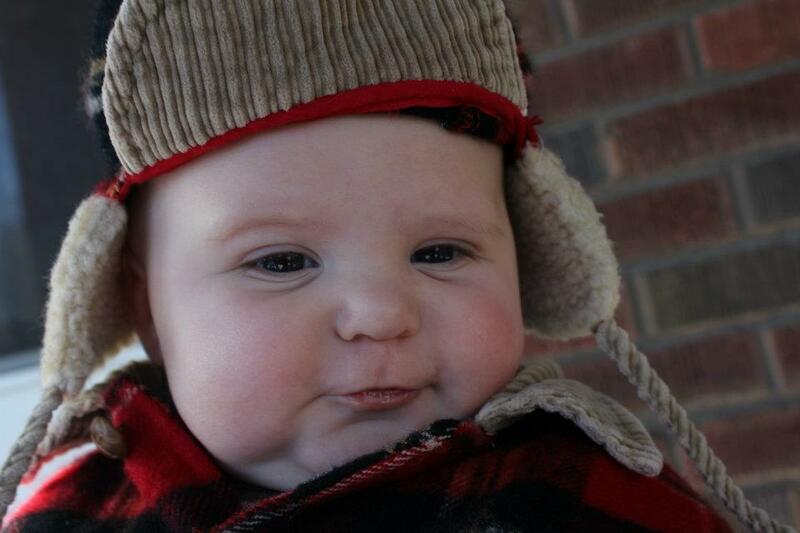 Though he was an extremely large baby (97th percentile for weight by 3 months old! ), my milk dwindled because I hated pumping at work. It was awkward and cumbersome to sit against an unlocked door to the conference room and haul milk around. FAIL 2: We used cloth diapers at home for the first year of his life. But once he entered daycare at age 1, we switched to disposables because of the center’s policies. FAIL 3: I picked up my baby when he cried. I nursed him to sleep. Though I may not have admitted it, these so-called “failures” made me feel guilty and inadequate. While intended for good, I had bought into ideals and made “resolutions” that, for our family’s situations, were bound to be broken. They were too specific and weren’t appropriate for us at the time. My daughter, the newest office baby, at 4 months old. Our surprise baby girl was born in August, and I’ve had the opportunity to do it all over again. I’ve borrowed a term from one of my friends: Intentional Living. Rather than resolutions of hard-to-keep actions and to-do lists or goals, I’m intentionally seeking out behaviors that will form into habits and shape my little world - not society’s expectations - for the better. Making choices that free up my schedule for flexibility (i.e. saying “no” more often). Spending more time with my husband, kids and other loved ones. One of the hardest decisions followed my recent maternity leave. I returned to a full-time career in which I loved with a two-week resignation notice. Until that moment I never anticipated I would become a stay- or work-at-home-mom (SAHM), but, because we intentionally sought out being more available for our family and friends, our daughter’s arrival created an opportunity for a career change. Within a couple weeks of my SAHM status, I was offered a part-time position at The Milk Bank in which I could work a few hours at home and bring my daughter with me while in the office. It lined up perfectly with our family’s desires. The staff has welcomed my daughter as a temporary coworker, knowing how important it is for breastfeeding mothers and infants to remain bonded and available to each other. They have supported us while trying to figure out naps during office hours, ignored her wailing and crying and haven’t flinched when needing to breastfeed in the middle of a meeting. My adaptable environment and schedule allows me to, as another friend said, “flex my work muscle,” while being available for my family. I am able to use my skills and talents to assist a mission I support and in a time frame where I can be most productive. I can make time for dropping off lunch when my husband has forgotten it, picking up my son from school and watching my daughter hit developmental milestones. Making choices that engage my brain, body and heart to serve others. Speaking less, listening and doing more. Being kind and empathetic. Now that my schedule is more open and available than it’s ever been, I have more time to be active and participatory. The baby and I volunteer in my son’s classroom a couple times each month, and I take home projects to help out his teachers. We’re looking into family service projects around our city. My husband has set up recurring gifts to several organizations. It’s an easy way to financially support causes we believe in without the need to remember to pull out the checkbook. We find we’re more interested in the growth and activity of these organizations after we make an investment in their missions. We can serve more people in our communities by supporting organizations who already have their boots on the ground. Because my time is precious, I’m not setting a specific book or exercise goal, but I realize the incredible value of continuing education and physical activity. I can learn about people unlike me and grow in understanding and empathy. I can build up strength to use my body for laborious work. For these reasons, I will intentionally stay active in 2019. Making choices that reflect my desires. Allowing myself to be vulnerable and teachable. While trying to maintain a Perfect Mom image during my son’s infancy, I wasn’t being authentic. I’ve learned better the second time around, but there are still times where I catch myself in comparison to another mom. We’re so critical of ourselves and others. Being authentic is the hardest of the three intentional behaviors for me to firmly establish. I am still learning to sift through unsolicited advice, standing firm and avoiding guilt or insecurity about our choices. We have a clear vision, so you’d think it wouldn’t be that hard to follow the path, right? Turns out being transparent and vulnerable with others establishes respect and trust you wouldn’t believe. While sticking with my gut is important, I also want to avoid being stingy enough to shut out opportunities for maturity and understanding. There is much to learn and do. While I’ve only had a few months’ practice in intentionally adapting these behaviors, I feel like I have more purpose in life. It’s fulfilling and redeeming enough to carry them with me into 2019. Not claiming to be perfect, it’s a daily choice and adjustment, and we don’t get it right every time. But I’ve learned not to dwell on shortcomings and to dust off my pants and try again. For me, it’s much easier to maintain behaviors than a dedicated, cut-and-dry resolution. I encourage you to adopt an intentional behavior - or, if you’re already doing so, call it out and stick with it - if you haven’t yet made a New Year Resolution. Perhaps it’s living generously, and you want to explore donation (milk or financial) or volunteer options to The Milk Bank or another organization. Perhaps it’s accepting help, and you are interested in lactation support or acquiring breastmilk for your baby. Don’t feel guilty if you don’t lose 10 pounds or finish a project right away. You know yourself and your family better than anyone else. Sure, not every day will be peaches and rainbows, but your intentional behaviors can shape 2019 into a positive and healthy year. You’ve got this! Leah Shattuck joined the staff in November 2018 as Social Media & Public Awareness Coordinator for The Milk Bank. She and her husband have a son in first grade, an infant daughter, a 13-year-old Italian Greyhound and a 9-year-old lab-pit mutt. Contact her at lshattuck@themilkbank.org.